In less than 24 hours after Donald Trump issued an executive order banning entry to the U.S. for people from seven Muslim-majority countries, thousands of people flocked to JFK airport when word got out refugees were being detained there. 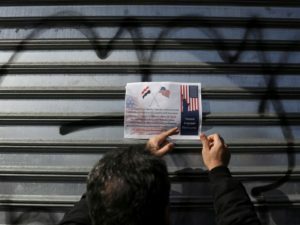 The protest inspired similar actions around the country that eventually pressured a federal judge in Brooklyn to issue a temporary stay of execution against the ban. 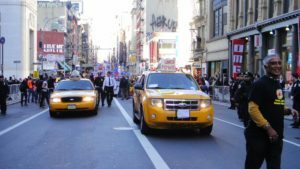 The NY Taxi Workers Alliance boycotted airport pickups from 6 pm to 7 pm Saturday in support the protests at JFK airport defending refugees. Their strike helped add pressure on the courts to issue a stay of execution against Trump’s ban. Uber tried to take advantage of the strike by ending their surge charges for airport rides from JFK. In response, #DeleteUber started trending on social media and over 200,000 deleted Uber’s app from their cell phones. The protest contributed to Uber’s CEO announcing his resignation from Trump business advisory council on Thursday. 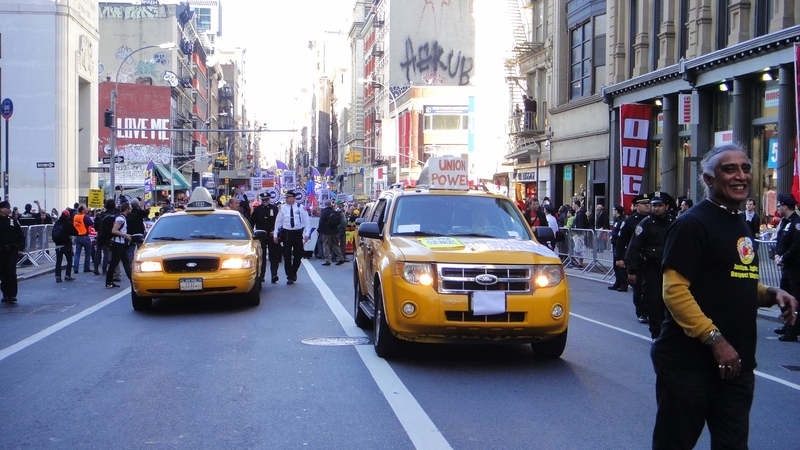 The NY Taxi Workers Alliance have made an invaluable contribution to the fight for justice by showing the power organized workers have to fight Trump, racism, and the capitalist establishment. 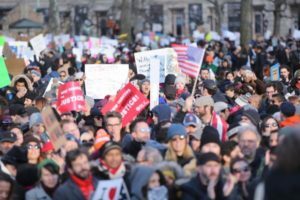 A day after the mass airport rallies and the U.S. East District Court ruling issuing a stay of execution against Trump’s travel ban, tens of thousands of people packed Battery Park and marched through Manhattan in defense of immigrants and refugees. The Democrats put themselves at the head of the rally, but when Senator Chuck Schumer spoke, some people in the crowd shouted at him for voting for Trump cabinet picks. Over 3,000 people rallied at Schumer’s home in the wealthy neighborhood of Park Slope in Brooklyn. Schumer voted for four Trump cabinet picks, and was met with protest at Battery Park on Sunday and at his office Buffalo. 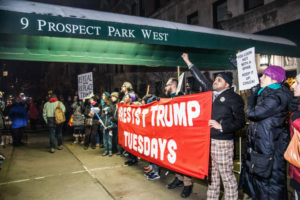 Protesters in Brooklyn on Tuesday chanted “filibuster everything” and “just vote no” and “resign or resist.” The New York Times reported on Monday that Democrats around the country were facing growing pressure: “The scale and ferocity of the anger coming out of the Democratic base has astounded even some party veterans. ‘There is much more energy opposing Trump than there ever was in reaction to George W. Bush and the Iraq War,’ said Paul Begala, a longtime Democratic strategist. ‘I have never seen so much spontaneous grass-roots energy on the left’” (1/30/17). Over 1,000 NYC Bodegas (small grocery stores and delis) were closed from 12 pm to 8 pm on Thursday in protest of Trump’s ban. Across the city, New Yorkers encountered shuttered stores with signs saying: “We are closing our business in support of our friends, family and loved ones who are stranded at airports and overseas.” Thousands rallied Thursday night outside Brooklyn Borough Hall.